Historical Great Smoky Mountains Landmarks listed in the National Register. 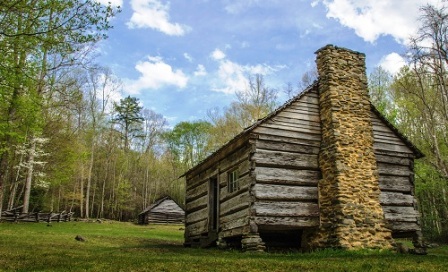 Our National Register of the Smokies offers interesting historical landmarks that have played important roles in the Great Smoky Mountain's rich heritage. ROARING FORK HISTORICAL DISTRICT : At one time this site was known as a small Appalachian community in the Tennessee hills of the Smoky Mountains. It's now known for it's incredible stream along Fork Motor Nature Trail. This peaceful body of water makes the hike such a peaceful, relaxing walk as it echos throughout the surrounding mountain ridges. However, it came by it's name honestly "Roaring Fork" by turning into a roaring whitewater rapid after as much as only a light rainfall. BUD OGLE FARM - This farm was built by pioneer Noah "Bud" Ogle in the late 19th century. On this farm is a "saddlebag" cabin built as two single-pen cabins joined together by a common chimney. It's rare in design for the region. There's a four-pen built barn which was very common, and Ogle's tub mill that is still operational. It's known as one of only a few tub mills in the area that still works. This farm has been renamed "Junglebrook." The farm became part of the Smoky Mountain National Register in the year 1977. 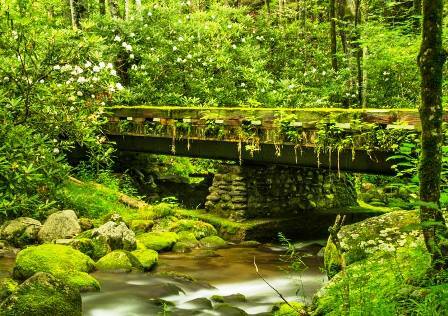 It is now being maintained by the Great Smoky Mountains National Park. 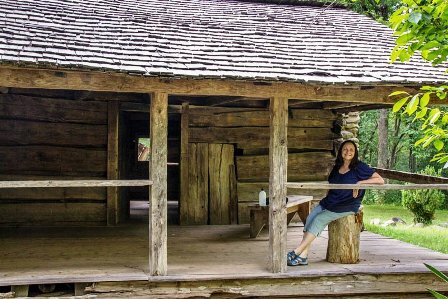 CADES COVE DISTRICT: History remains alive and well inside this National Register historical site. Millions come every year to the Tennessee side of the Great Smoky Mountains to Cades Cove's many historical, and well preserved landmarks. It's the perfect place to enjoy Smoky Mountain's historical roots. It's one of the most popular places in the Smokies to hike, bike, go horseback riding, or enjoy wildlife in it's natural habitat. ELKMONT HISTORICAL DISTRICT: The region of Elkmont is a pioneer community that sits in the upper Little River Valley of Sevier County, Tennessee. History echos throughout this little town! It's been the home to a pioneer Appalachian community, a logging town, and a resort community. Today Elkmont's most popular spot is their huge campground, and it is one of only two places in the world where Fireflies gather to mate in unison. This is one of the area's biggest events! Tourists flock to Elkmont every year during the month of June to see the beauty of the blinking fireflies. 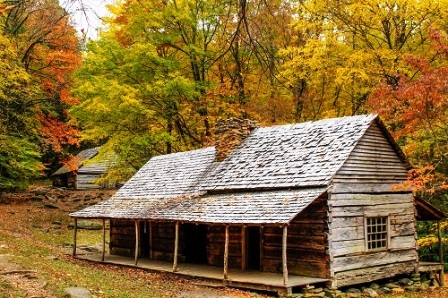 ALEX COLE CABIN - This historic structure in Sevier County is a single-pen one-story cabin. It's the last remaining building in the Sugarlands community proper. Built by Albert Alexander "Alex" Cole, this cabin was originally located across from the Little Pigeon River. After it was chosen to be part of the National Register of Historical Places in the 1970's, the cabin was moved to the Roaring Fork Motor Nature Trail. Alex Cole was an industrious resident of the Sugarlands area in the early 1900's. He and his sons worked for Little River Lumber Company. In the 1920's he guided tourists through the mountains because of his vast knowledge of the area. WALKER SISTERS PLACE. The sisters lived in Sevier County and became local legends. There were five of them, and none ever married nor did they ever leave their farm, or sell it when the area became part of the Great Smoky Mountains National Park. In the 1940's they received national press coverage which made them famous in the area. Many tourists came to the Greenbriar area where the girls lived to meet them. The last of the sisters passed away in 1960. 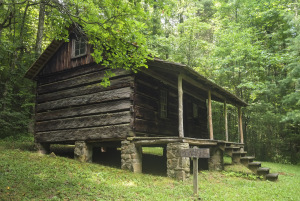 Their little cabin is now part of the Great Smoky Mountains National Register. MESSER BARN. The John Messer Barn was built in 1875 by Pinkney Whaley. The farm was later sold to John H. Messer who wed Pinkney's cousin. The Smoky Mountain Hiking Club had built a cabin nearby, and leased the barn from the National Park Service. Located in the Greenbrier Cove community, it is the only structure that exists before the Great Smoky Mountains National Park came into existence. John's cousin Will Messer built a barn in the Cataloochee area. This is an entirely different barn from the John Messer Barn which is located along the Porters Creek Trail in Greenbrier valley. This barn was added to the National Register of Historic Places in 1976. LITTLE GREENBRIAR SCHOOL CHURCH. Little Greenbriar, once known as just "Greenbrier is a former Appalachian community on the Tennessee side of the Great Smoky Mountains in the northeastern section of the national park. The school church began because of great need in the the area. The government informed the community they would pay the teacher if the school was built. In 1882, the town came together to build the little schoolhouse which also served as a church. This structure served the community as an educational institution and a place of worship for over 50 years!